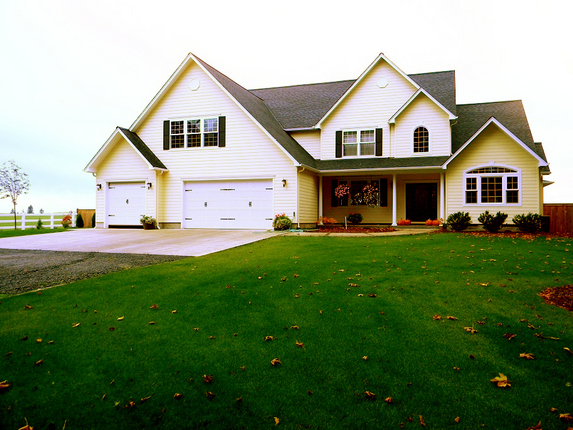 A beautiful custom home construction in the Eugene area appears welcoming from the exterior. 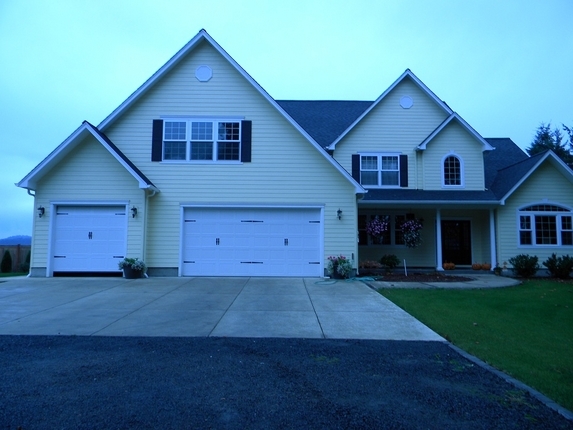 Even a large lawn does not dwarf this spacious home. Our custom homes each have their own personality that comes from the attention to detail that goes into every construction. 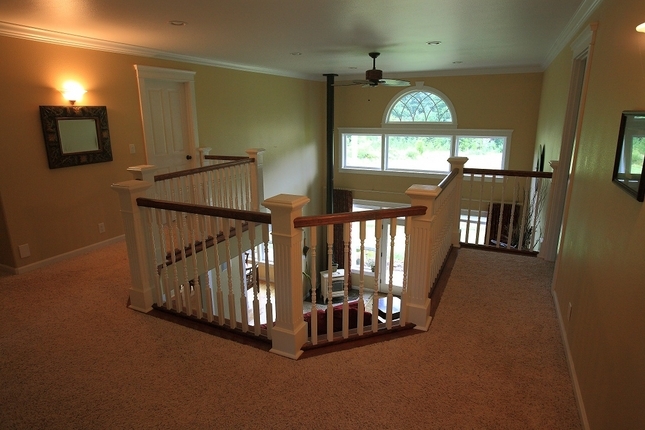 All of our custom home constructions are built to the specifications of the owner. In this case two garage doors provide plenty of space for cars, as well as anything else that needs to be protected from the elements. This is where Scott Ritchie's cabinetmaker's eye is on full display. 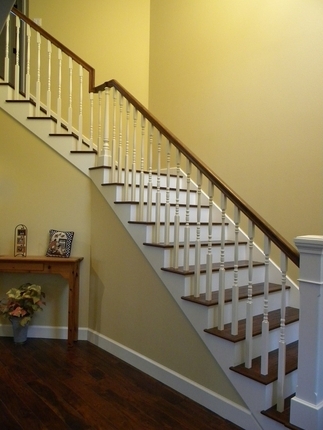 The precision that went into this custom staircase gives it a smooth flow despite a unique angling. This custom balcony is set across from broad windows to give a great view. By overlooking the living room it creates open space that could otherwise feel cramped. 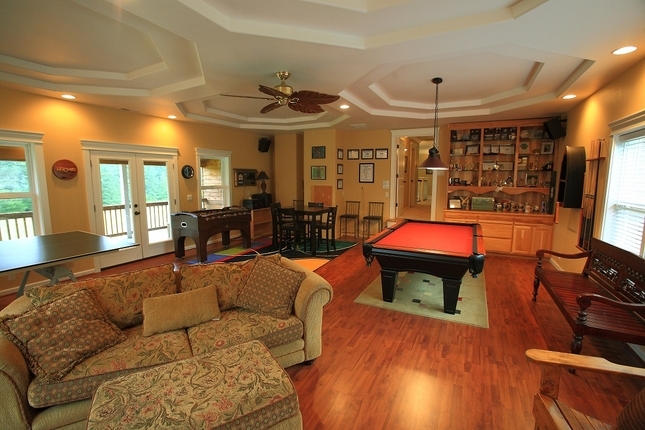 The open layout and solid hardwood floors of this family room give plenty of space and sturdy support for whatever games go on inside. 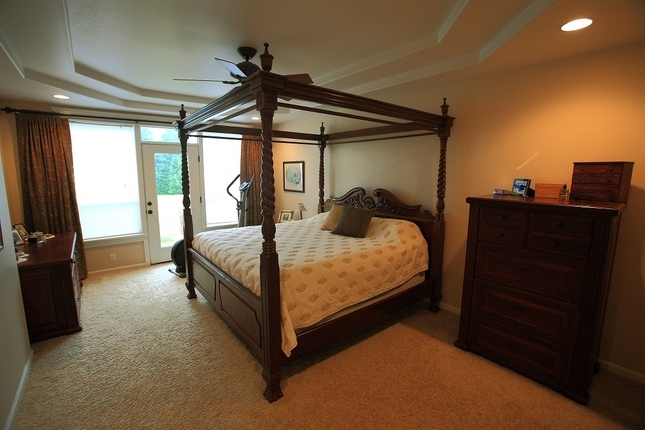 This custom bedroom needed high enough ceilings to accommodate an elegant bed frame. The door to the outside not only offers great lighting, but a convenient way to enjoy the outdoors, morning to night. An open living room is important to creating a relaxing environment. 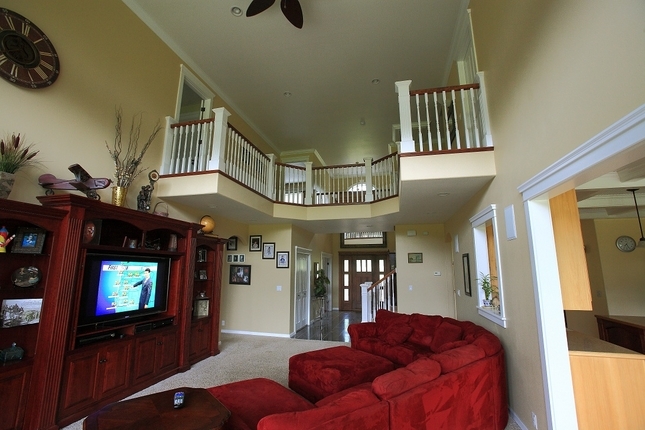 The open balcony, window to the kitchen, and large entryway all open up the space. These are the kinds of details that Ritchie Homes pays attention to in all of its custom home constructions and remodelings. 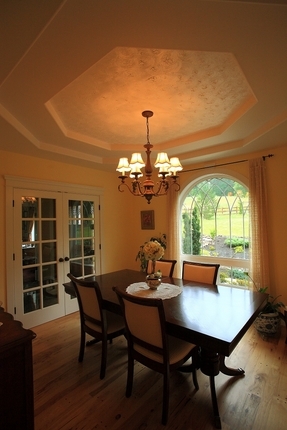 The design for this formal dining room provides an elegance and class to the space. The double doors, beautiful natural and artificial light and sturdy hardwood floors are details you can only find in custom homes. 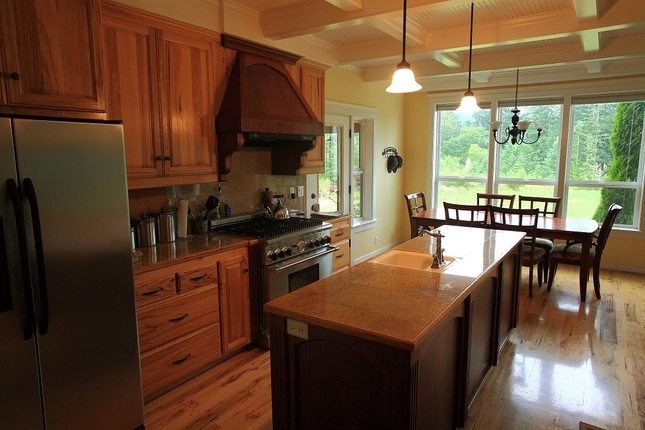 This kitchen has plenty of open space for cooking and entertaining. The modern appliances add elegance and functionality. If your dated appliances are holding you back, consider a kitchen remodel. Ritchie Homes is an expert when it comes to kitchen remodeling in the Eugene area and we would be happy to assist you at any stage in the process. 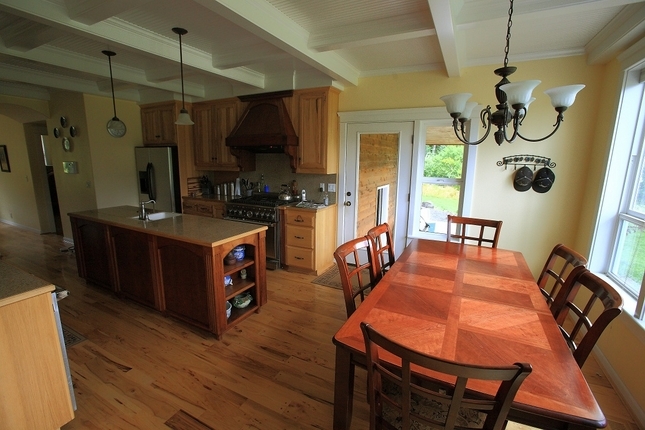 The large windows let in a natural light that opens up the kitchen space and creates a pleasant dining experience. This is a great example of the importance of design in essential rooms like the kitchen. Our eye for details like this is what makes Ritchie Homes constructions special. Kitchen feeling cramped?Consider a remodel! A kitchen remodel can add more space as well as tricks like natural lighting to open up what space you have. 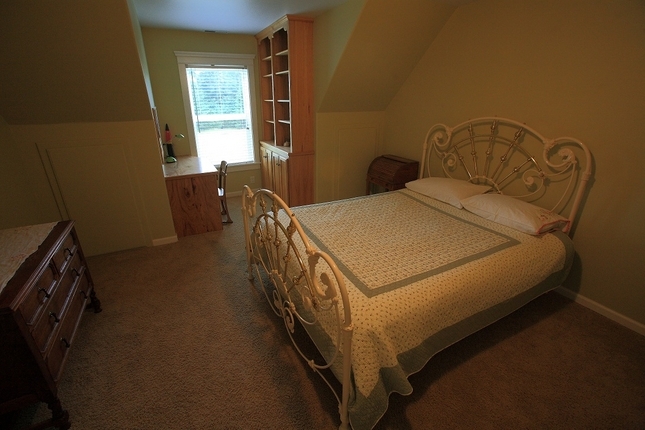 Our eye for details helps us maximize the space in every room. Even the sloped ceilings don't confine this space as we use the window bay to maximize space and fill the room with natural light.